Wanting to make The Best Homemade Chocolate Brownies? 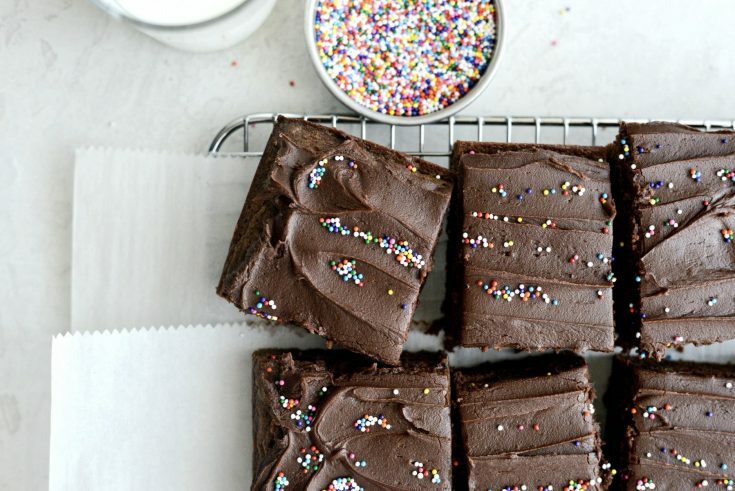 Look no further than these decadent frosted brownies. 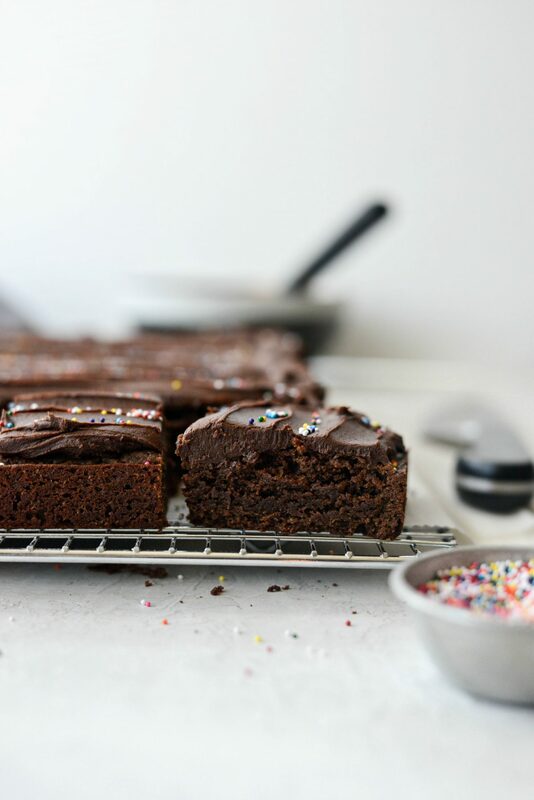 Simple ingredients and the perfect brownie to frosting ratio, plus sprinkles. What more could you ask for? 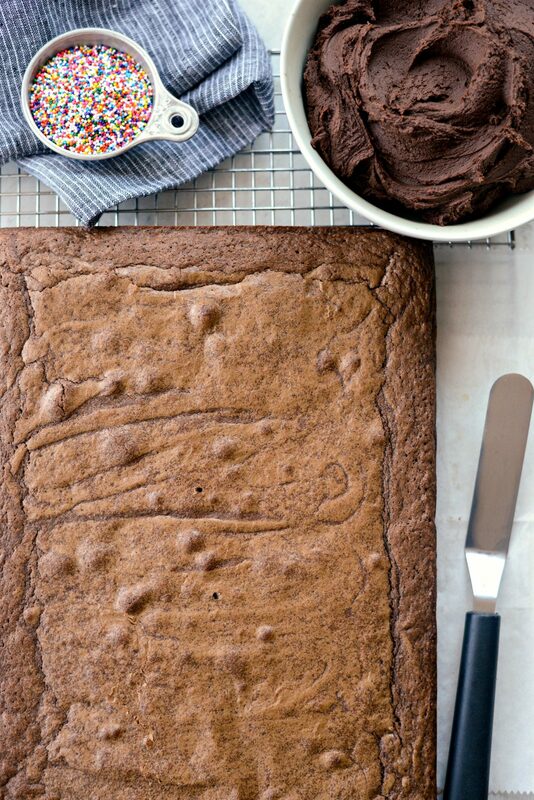 Meet the BEST homemade chocolate brownies. I call them “The Best” because, I’m super picky about brownies. And if I’m being honest, I’m simply not a brownie fanatic. Brownies tend to be either overly sweet or too rich and it’s just not the dessert I crave. 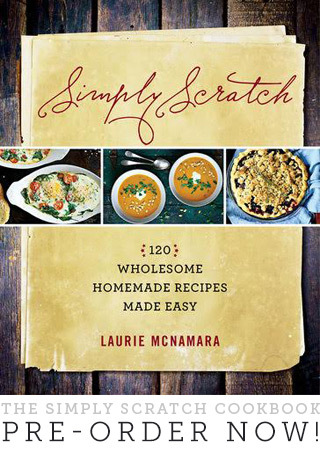 But if I do make homemade brownies, this is my go-to recipe, along with the recipe from my cookbook. 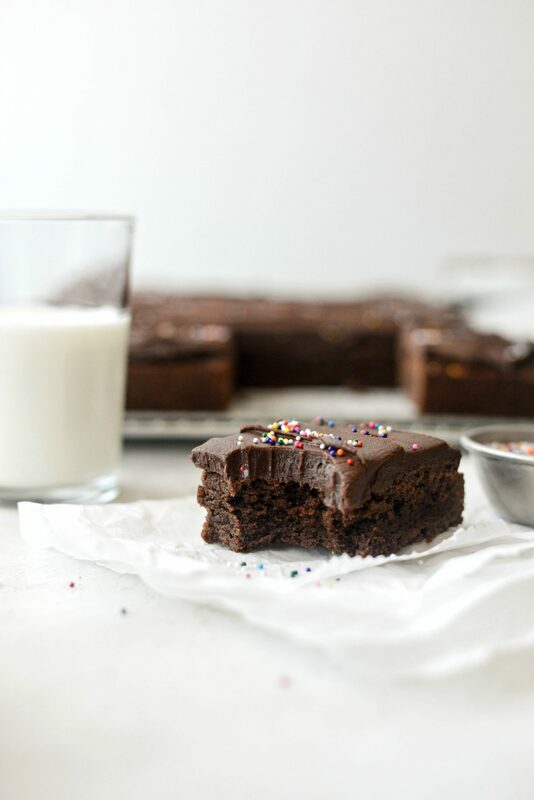 It’s simple, straightforward and yields ridiculously delicious brownies. This brownie was adapted from a recipe that a former coworker gave to me. Back when I worked in the ER, Jan (a pediatric nurse) would bring in the most fantastic frosted brownies from time to time. It felt like winning the lottery if I just so happened to be working the same night that she brought them in. 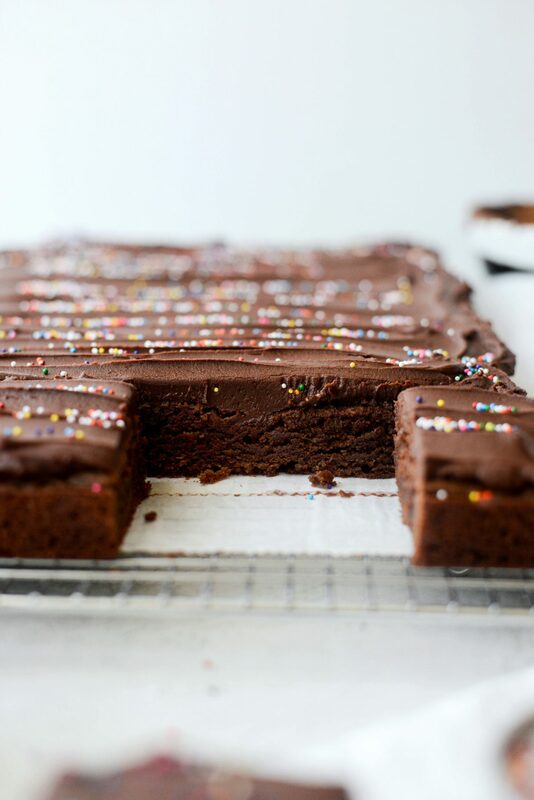 And I loved how her brownies always had these little round sprinkles on top. Everyone and I mean everyone loved Jan’s Brownies and to this day, I still do and so does my family. 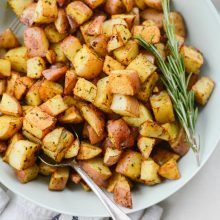 I originally posted a similar version of this recipe 9 years ago. 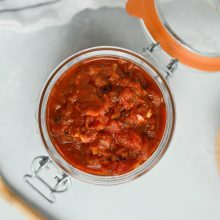 In 2001 I really had no clue what I was doing with this blog, how to use camera or write a coherent recipe instructions. The latter is still questionable. 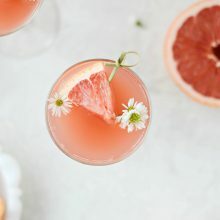 Recently I decided to make them with updated fresh new photography and recipe instructions. And I remembered just how incredible they truly are. 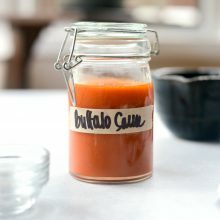 The only change I made to Jan’s winner of a recipe was swapping in butter for shortening, because I never have or use shortening, even if it is organic. However unsalted butter is an excellent substitution. In fact, I think it lends a better flavor and helps with a more tender crumb texture. 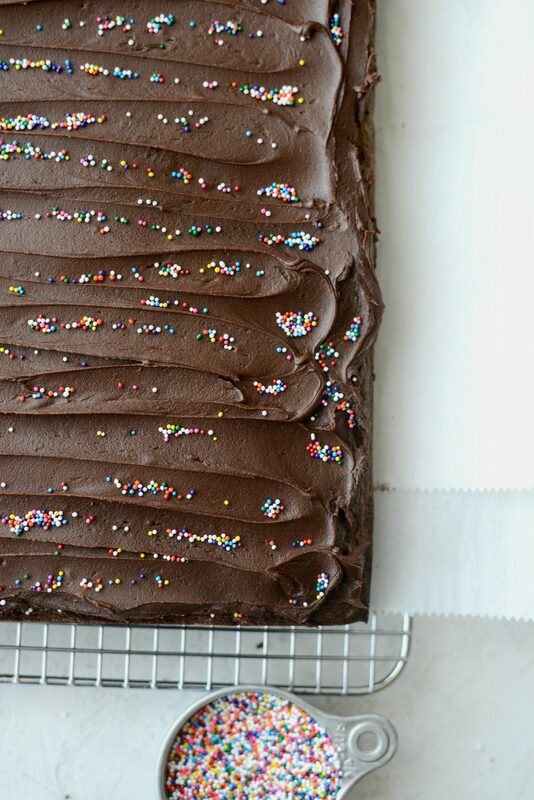 Then I topped the brownies with my FAVORITE homemade chocolate frosting recipe and of course, all the sprinkles. The end result is a moist, slightly fudgy and cake-y chocolate brownie. 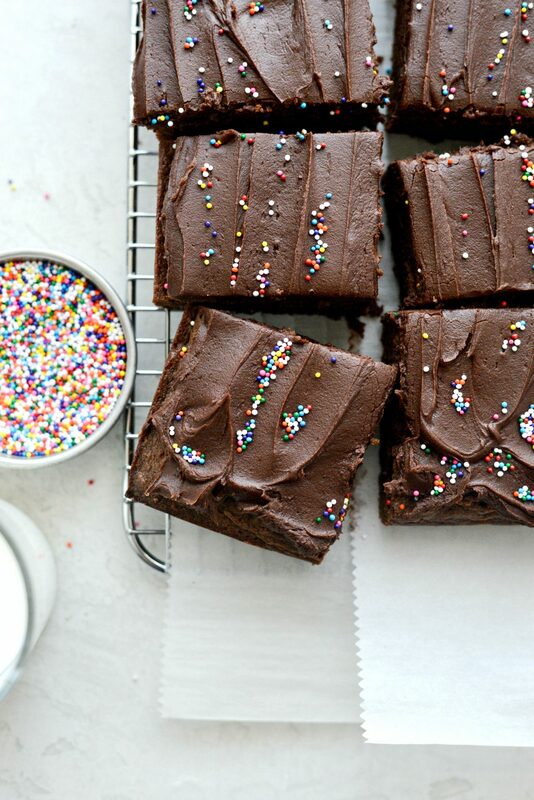 And a frosted brownie is the best kind of brownie. You won’t want to share these. I promise. 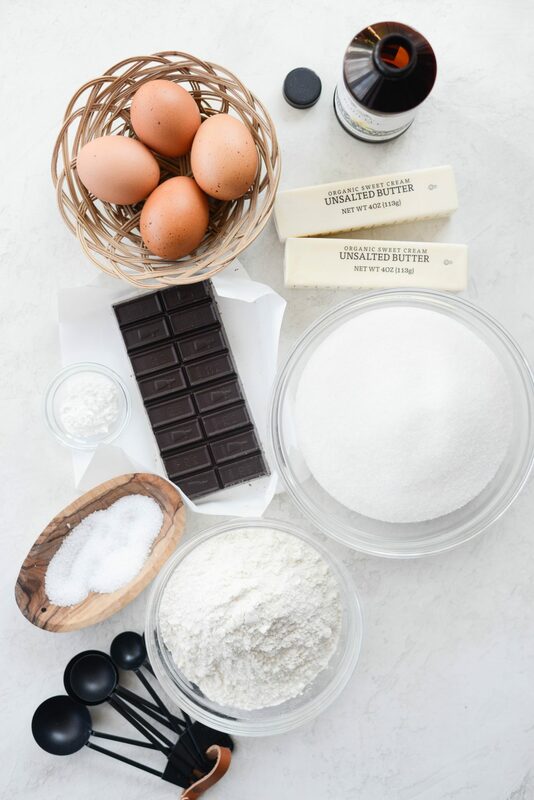 To make the brownies you will need; 1-1/2 cups unbleached all-purpose flour, 1 teaspoon baking powder, 1 teaspoon kosher salt, 1 cup (2 sticks) unsalted butter, 4 ounces unsweetened chocolate, 2 cups granulated sugar, 4 large eggs and 2 teaspoons pure vanilla extract. I frosted these brownies with my homemade chocolate frosting. 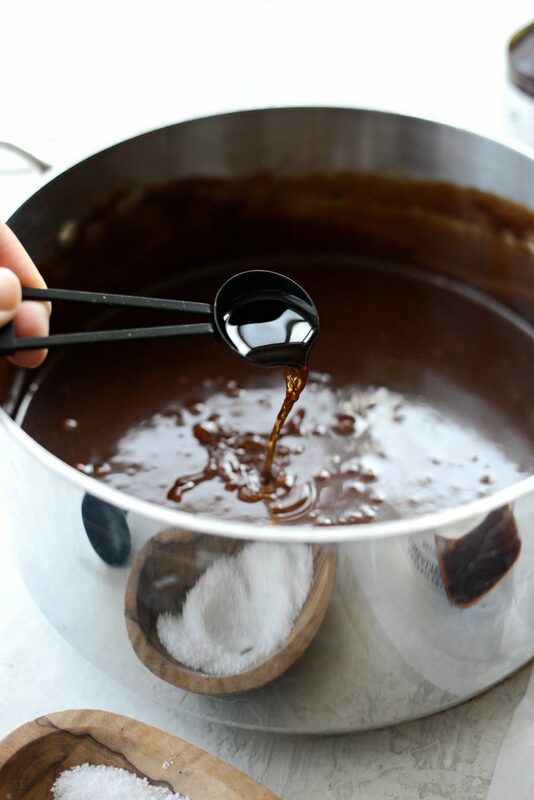 Next, roughly chop the 4 ounces of unsweetened chocolate. 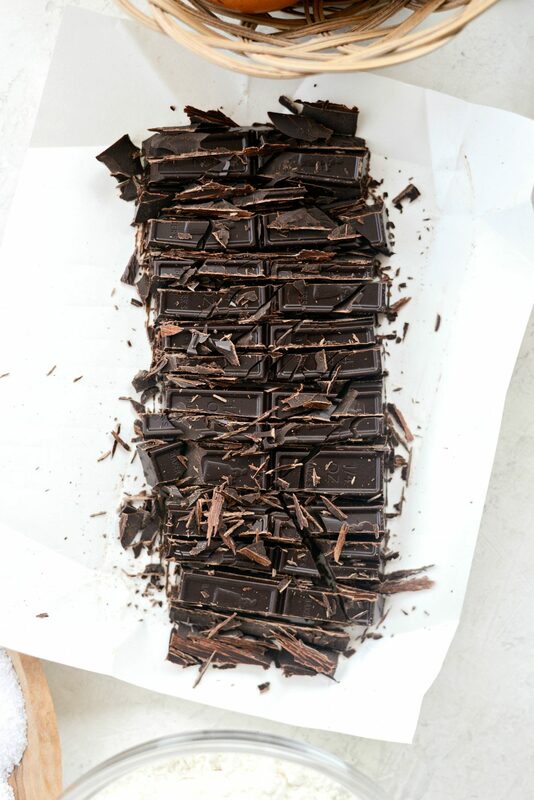 To this day, chocolate is my favorite thing to chop with a knife. Then add it to a medium saucepan along with the butter. Heat on low, stirring occasionally until melted. Remove off of the heat to cool for a minute. 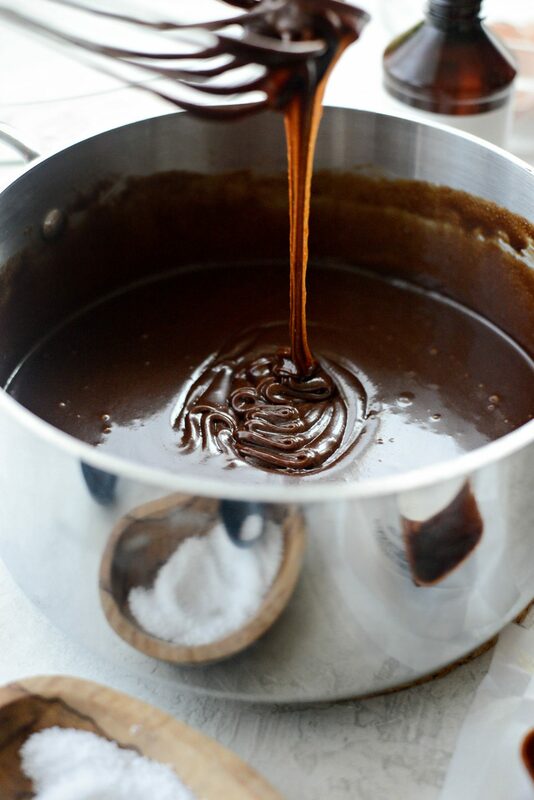 Then add the 2 cups of sugar to the chocolate mixture and whisk until combined. Next, crack and add in one egg at a time, whisking after each additional egg. Lastly, measure and add in 2 teaspoons vanilla extract. 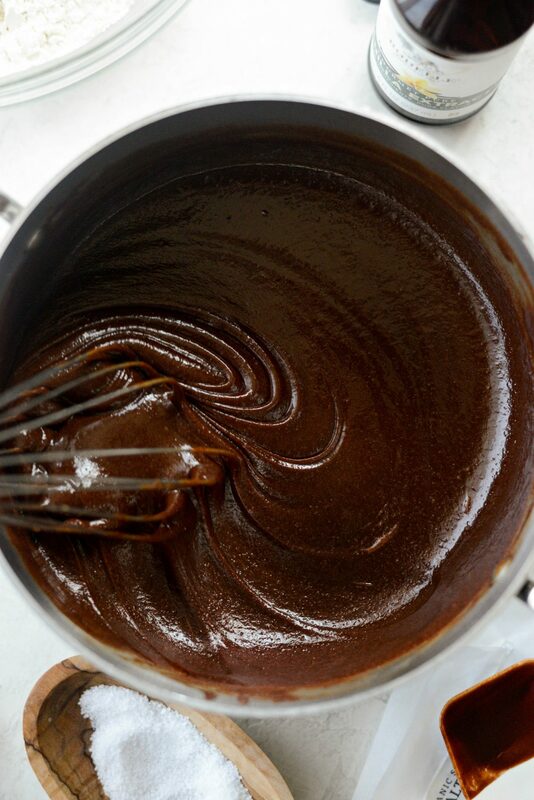 The batter should be thick and glossy and smell heavenly. 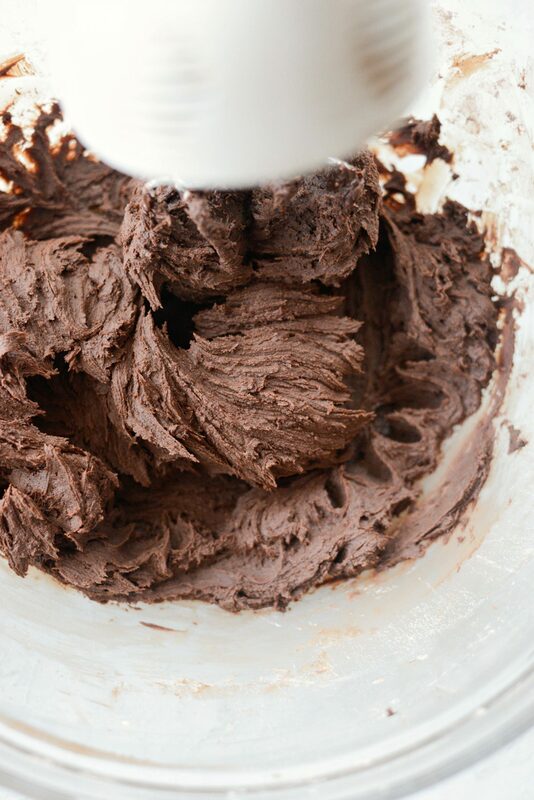 Then pour the brownie batter into the mixing bowl with the flour. 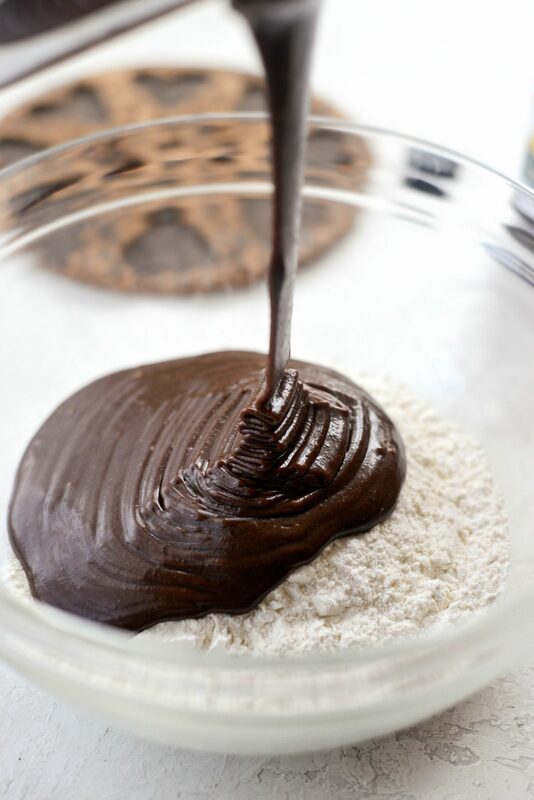 Switch over to a rubber spatula, folding and mixing until the flour is incorporated. 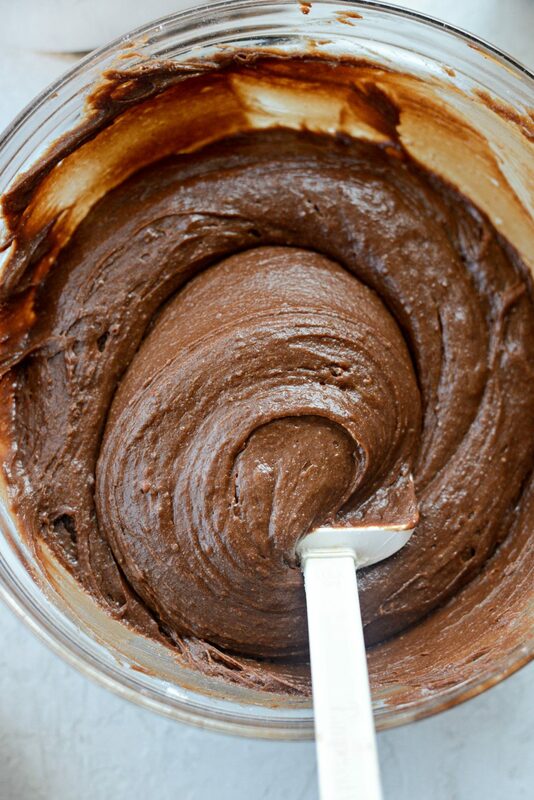 Next, spoon the brownie batter into your prepared pan. Earlier, I sprayed and lined a 9×13 baking pan with parchment paper. The paper keeps the brownies from sticking and also helps ease the brownies out of the pan in one fell swoop. Next, with an offset spatula, spread the batter out evenly and maybe even tap the pan on the counter to get it to settle into the pan. 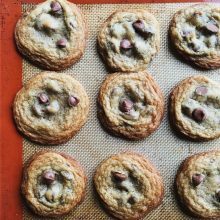 Finally, bake on the middle rack of your preheated oven for 18 to 20 minutes. Rotating the pan halfway through baking. 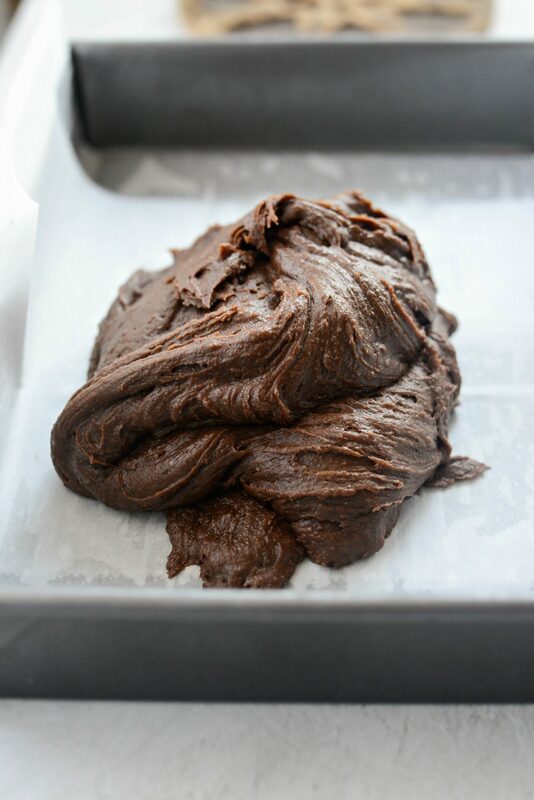 For a more fudge-y brownie, slightly under bake by a minute or two. 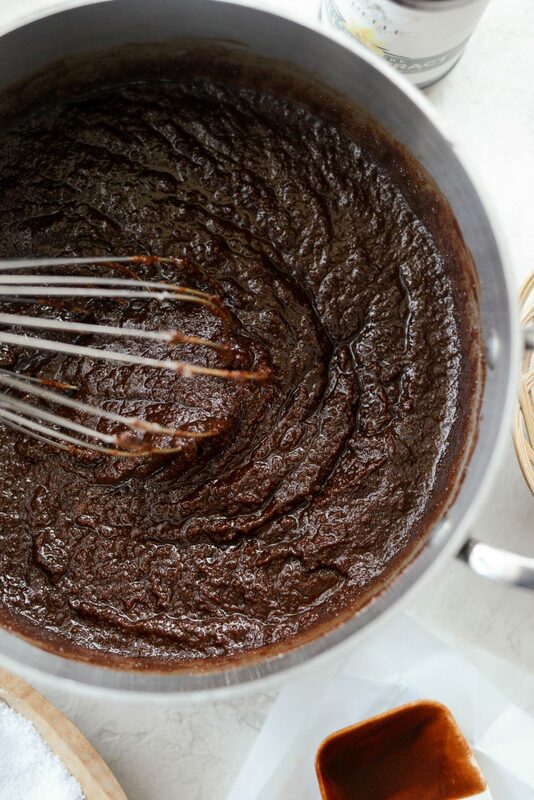 Once baked, allow the brownies to cool for 20 minutes. 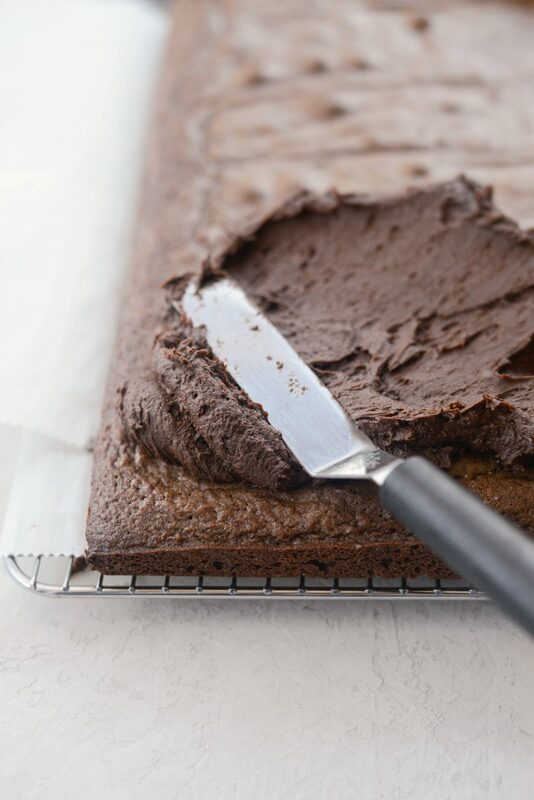 Use an offset spatula or butter knife and run it around the edge of the brownies. Using the parchment “handles” remove the brownies to a wire rack to finish cooling. 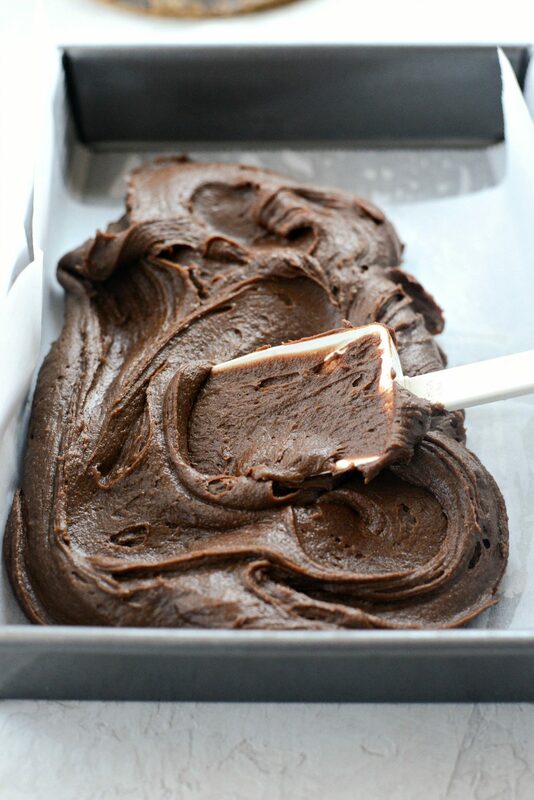 In the meantime, make the homemade chocolate frosting. 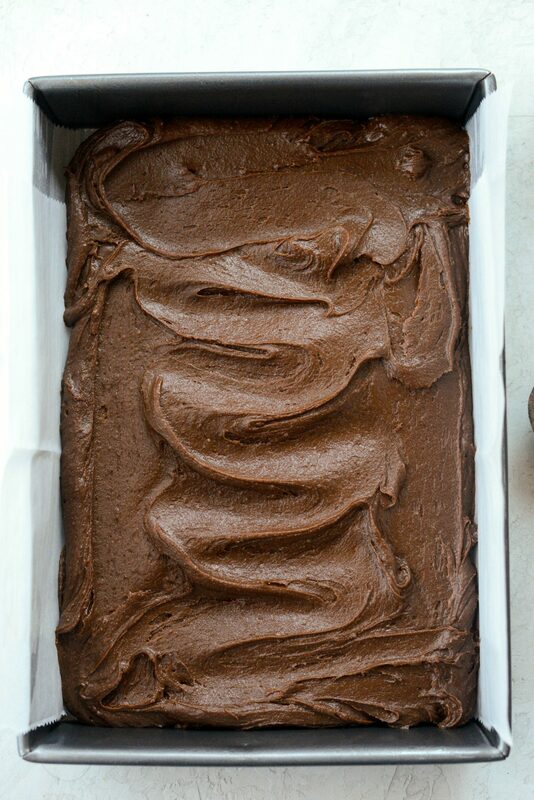 Once the brownies are cooled, spread the frosting the the edges of the brownie in an even layer. Lastly, sprinkle with fun colorful sprinkles. I call dibs on a corner piece! Enjoy! 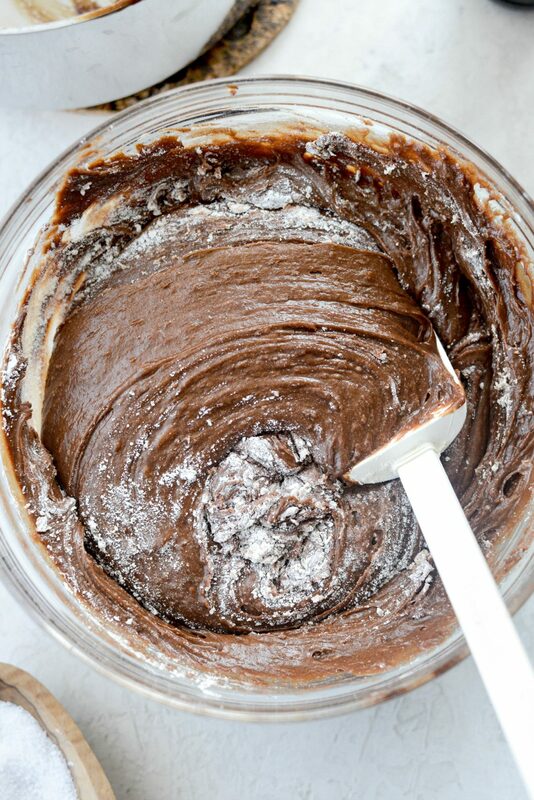 And if you give this Homemade Chocolate Brownie recipe a try, let me know! Snap a photo and tag me on twitter or instagram! 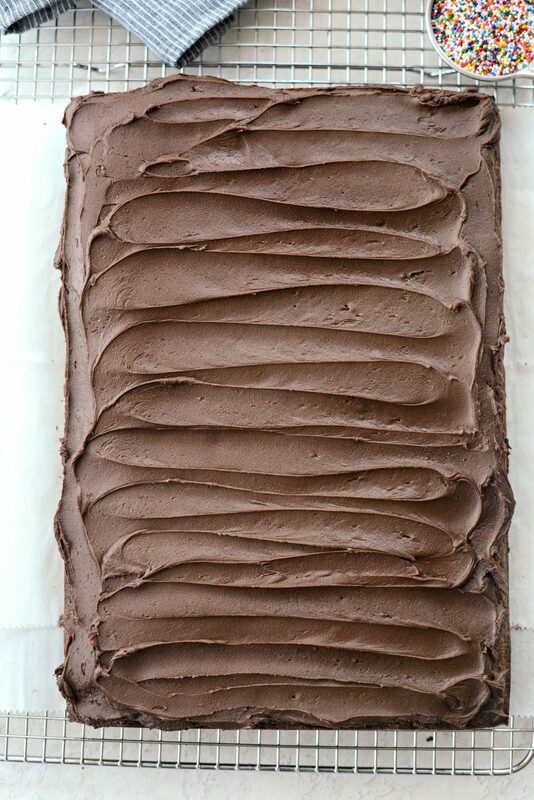 If you're looking for a perfectly fudge brownie, look no further because Jan's Brownies are it! This recipe was given to me from a former co-worker and it's one I hold near and dear to my heart. A homemade brown topped with homemade frosting! 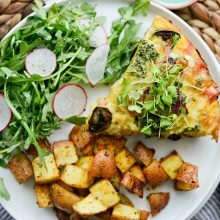 Preheat your oven to 350° and grease and line a 9x13 baking pan with parchment. 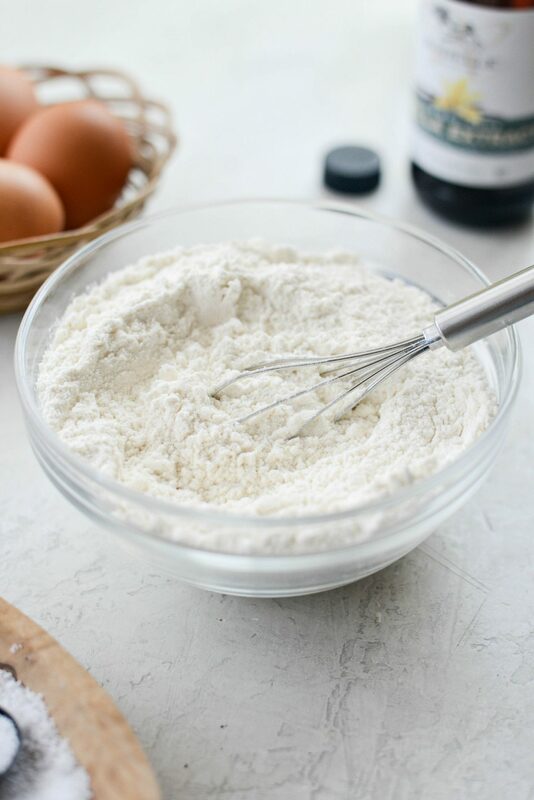 In a mixing bowl, whisk together the flour, baking powder and salt and set off to the side. 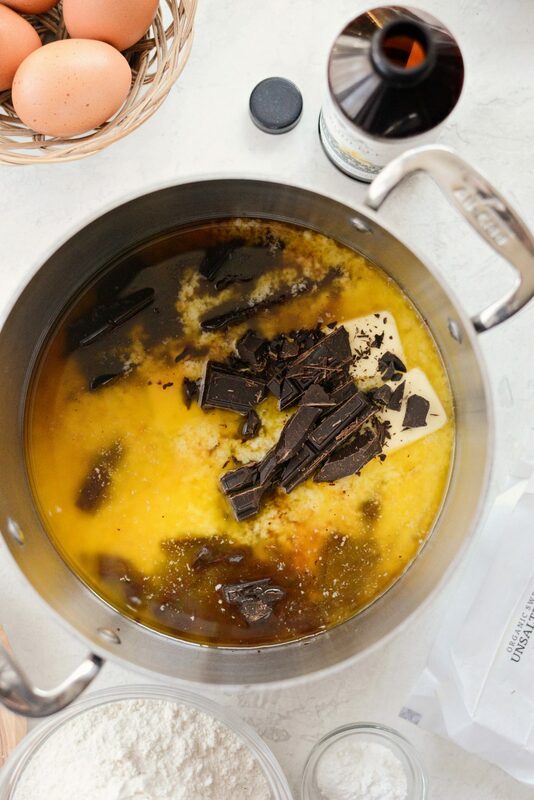 Roughly chop the chocolate into chunks and add it along with the butter into a medium sauce pan. Heat over low heat, stirring often until all the chocolate is melted. Remove off of the heat and let it cool slightly. 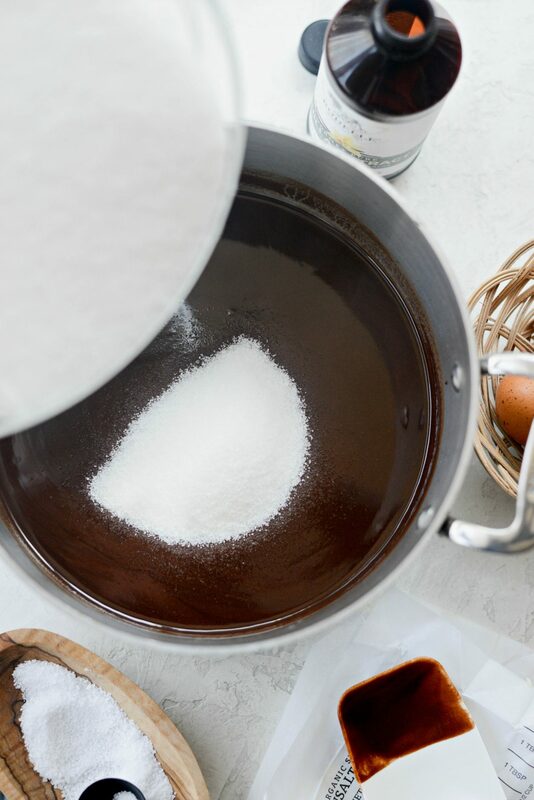 Next, whisk in the sugar to the chocolate mixture and then add in one egg at a time, whisking after each additional egg. 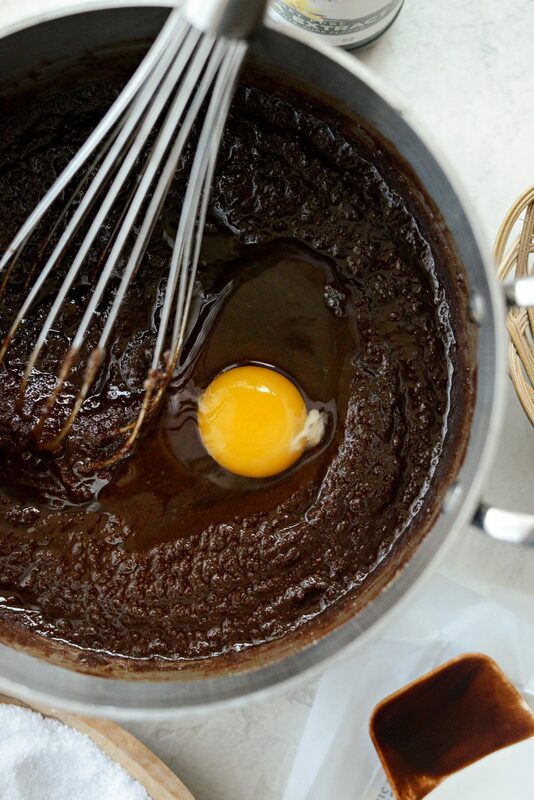 The batter should thicken significantly because of the eggs. Lastly add in the vanilla. 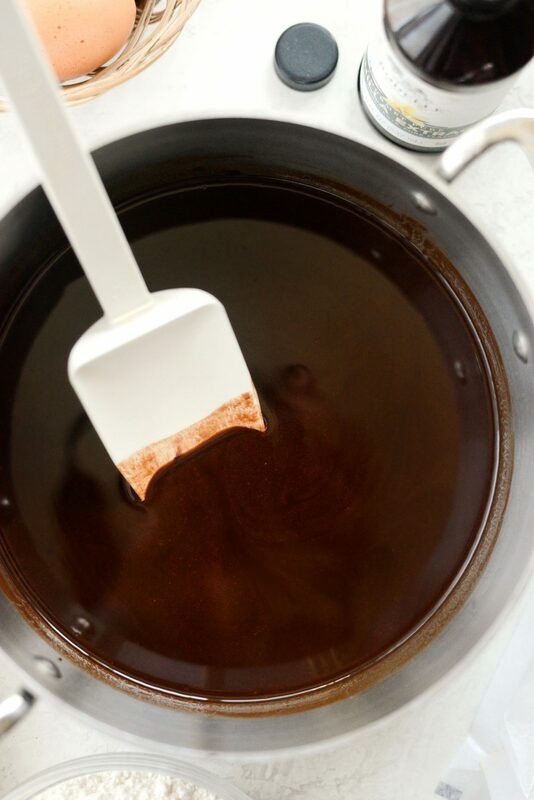 Pour the chocolate mixture into the dry ingredients and, using a rubber spatula, combine just until the flour gets incorporated. 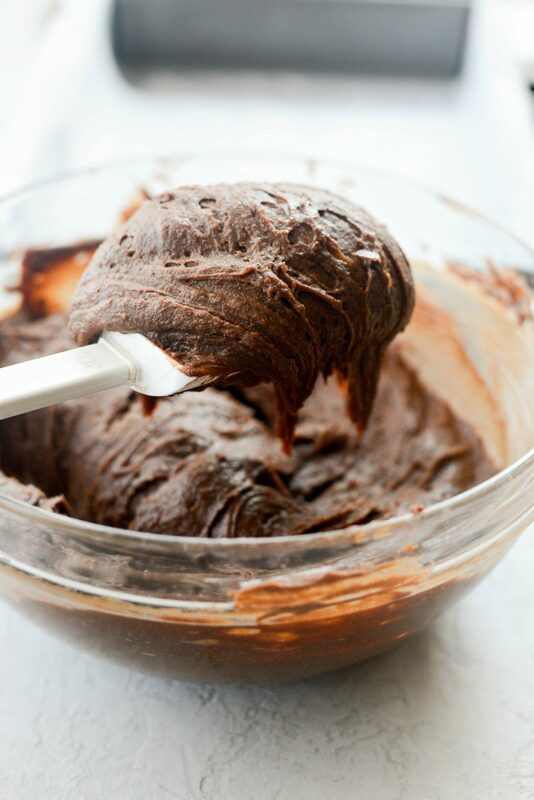 Next pour the brownie batter into the prepared baking pan, spread out evenly with an offset spatula and bake on the middle rack of your preheated oven for 18 to 20 minutes or until a tester comes out with only a few crumbs attached. 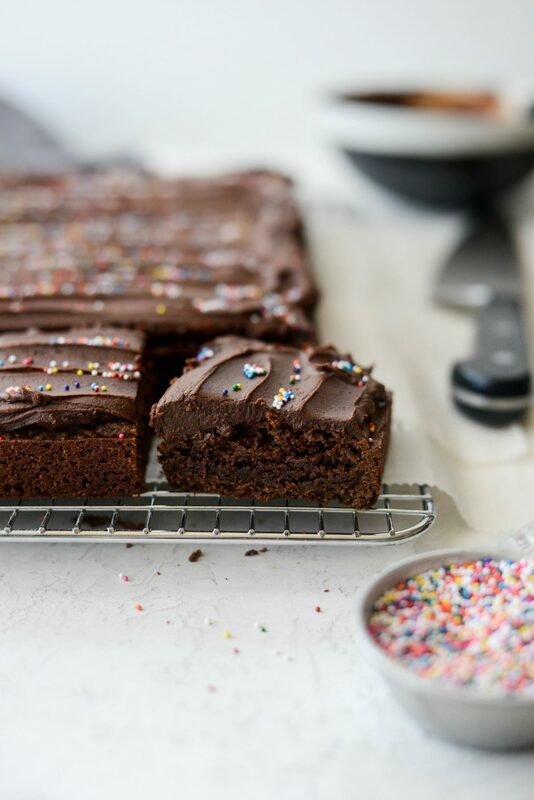 Bake for less time for a more fudgy brownie. Let cool before frosting and serving. You can do it, Dominique! The vanilla extract wasn’t included in the instructions as to when to add. Thanks! 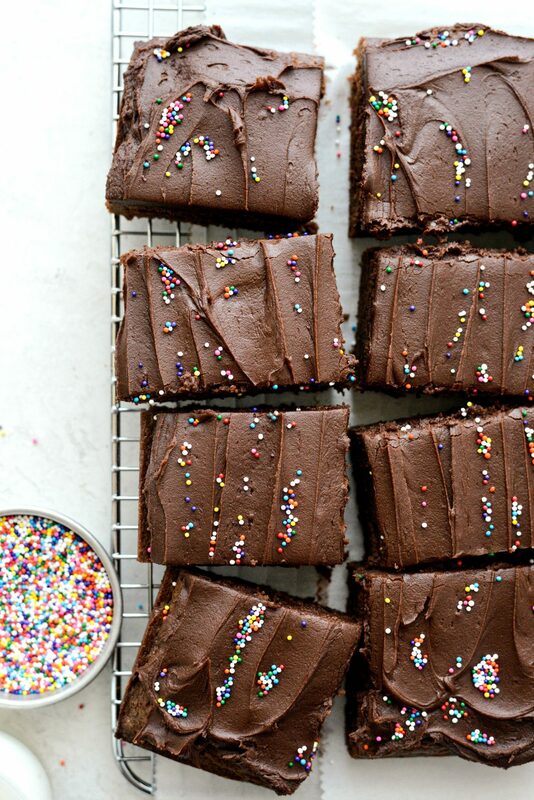 Delicious brownies!